Sox victories in the Sox first ten home games. ON THIS DATE (April 10, 1998) ... It ended just before dusk with the magnitude of Mo, a grand slam that may rank as the greatest closing act ever seen in a Fenway opener, seven runs from seven batters in the bottom of the ninth inning of a 9-7 win over the Seattle Mariners. It began with a broken-bat single by Troy O'Leary. It continued with a walk by a guy who had spent exactly one night in Boston, second baseman Mark Lemke, the newest member of the Red Sox, who fouled off three pitches before drawing a full-count walk from Heathcliff Slocumb, who had been summoned by Seattle manager Lou Piniella to protect a 7-2 lead for Johnson. The Big Unit was done after eight, having struck out 15 batters while allowing just two hits, one a two-run home run by Damon Buford in the fourth that gave Boston a 2-0 lead. Those in the sellout crowd of 32,805 who elected to stay had booed when ex-Boston closer Slocumb entered the game. He gave them reason to cheer before he left. Darren Bragg, who on an earlier at-bat didn't blink when a 98-mile-an-hour fastball from Johnson came perilously close to his head, followed Lemke by lashing a double into the right-field corner. Jimy Williams sent Scott Hatteberg to the plate to hit for Darren Lewis. Piniella signaled for a lefty, Tony Fossas. Williams countered with Mike Benjamin. Benjamin, drew a full-count walk. Bases loaded, Nomar Garciaparra coming to the plate as the tying run in a 7-3 game. Out came Piniella again, waving this time for Mike Timlin, a righthander. Garciaparra fought off a couple of tough pitches, then lined a 1-and-2 delivery to center field for a single that scored Lemke, making it 7-4. The next batter was Valentin. Valentin's bat broke when he lined a foul into the third base seats before being hit by a pitch. 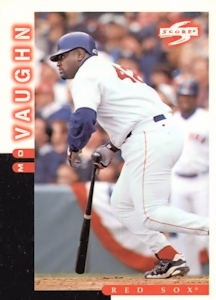 On deck ... Mo Vaughn. Williams was standing on the steps at the end of the dugout closest to home plate when Vaughn connected. Bragg leaped out of the dugout, pumping his fist. Back in the clubhouse, rookie Brian Rose, who had pitched so well for five innings but had been looking at a loss after Seattle's three-run sixth, whooped in front of the TV. At home plate, Valentin waited to embrace his close friend with a host of teammates, while Olde Fenway shook with raw passion, almost all of it joy. It was only the home opener. But until there is another October for the Olde Towne team, this will do.